Easy claim processing and app and additional ‘extras’ covered. Annual limits can be reached with one single catastrophic illness or injury. GET A FIGO QUOTE TODAY! Figo was started in Chicago and has been featured on several shows and online magazines for its Pet Cloud, revolutionary look at pet care where all records for your pet are kept in one online location, so any emergency vet has access to all records at all time. Figo is underwritten by Markel Specialty, which is one of Markel Corporation’s five insurance divisions. Markel is publicly held (NYSE-MKL) and has been in business since 1930. It is important that you know and be able to research who is underwriting your insurance policy, since that stability is going to have an impact on how they deal with your claims. Markel Corporation has a good reputation overall for their insurance products, paying claims and stability. Figo has three plans you can choose from, and a variety of reimbursements and deductibles to customize your plan. Their plans average $1.50 a day. 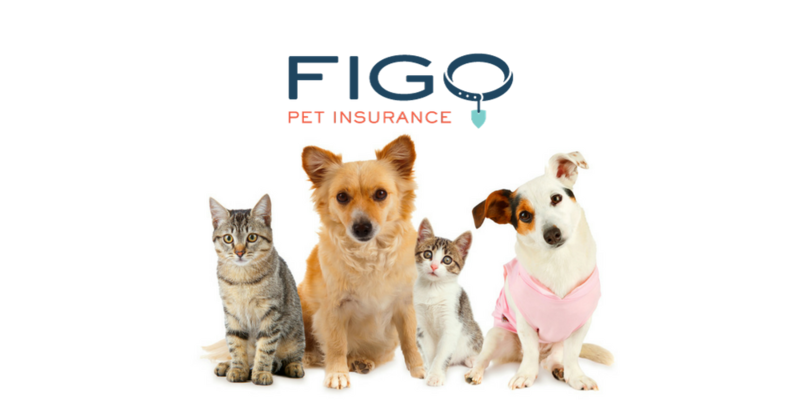 Figo has three levels of coverage for its pets: Essential, Preferred and Ultimate. These range in what they cover as well as the annual benefit, typically ranging from $10k in annual benefits up to unlimited annual benefits for a higher monthly premium. Figo covers veterinary exam fees, as long as they are for an injury or illness of a covered treatment. Figo does not cover exam fees for routine care, as these are considered preventive or maintenance. Figo covers all emergency and hospital care from licensed veterinarians. Surgery is covered as long as it is related to a covered injury or illness. Figo also covers hereditary and congenital conditions, so long as they are not considered pre-existing. They cover prescription medications, cutting-edge cancer treatments such as CyberKnife radiosurgery, Cardiology, Neurology, Orthopedics, Advanced Imaging and other types of specialty care. Other than that, Figo covers some standards such as physical therapy, prosthetics, euthanasia, stem cell therapy and more. There are some other items of note that Figo covers, sometimes in their basic plan, and other times in a more comprehensive plan. Some of these are: coverage for a lost or stolen pet (you must have the original payment receipt for the full amount), boarding when due to sickness or injury, behavioral therapy and advertising and reward for a lost or stolen pet. In addition, they have Vacation Cancellation and Mortality benefits that are pretty interesting. With the different plan levels, the coverage amounts are $250, $500 or $1,000 for behavioral problem coverage, no coverage for emergency boarding or unexpected death at the lowest level. We did a sample quote for ‘Bob,’ our Standard Poodle, age 7. You will see us use him on other pet insurance company plans, to standardize our quotes, so to speak. For Figo, we chose the middle plan, the Preferred plan, and selected a $200 deductible with 80 percent reimbursement, and came up with a monthly premium of $69.89. For the same pet, we can manipulate the variables and have a $50 deductible (their lowest option) and 100% reimbursement with a $206.49 monthly premium. While this is far more expensive monthly than you will see with other insurers, we do see that Figo offers more in terms of 100% reimbursement (that is hard to find elsewhere) and they cover lots of unique pet health-related expenses, both emergency and non. For pet owners who want the peace of mind of knowing they have coverage without tens of thousands of dollars of upfront cost, that high monthly premium may be worth it. Even at $200/month, that is still $2400 annually, which is still far less than even one emergency vet appointment can cost. You can also save several dollars a month if you are an active duty military or veteran. We did another quote for a younger, smaller dog to see if there was an impact on the rate. We looked at ‘Willa,’ a two-year-old Yorkie, and her monthly rate with identical coverage was about half, at $32.91. Even with the absolute most coverage, we found that Willa’s rate was about half as much as an older, larger dog, coming in at $97.24 per month, even with 100% reimbursement. Figo also has discounts for multiple pets, and you can easily add the additional pet to your quote as you work your way through the Figo website and quote builder. Figo does have annual limits. These are $10,000 for the Essential Plan, $14,000 for the Preferred Plan and Unlimited for the Unlimited Plan. Figo has a 14-day waiting period for illnesses, and a 5-day waiting period for accidents. You can purchase your Figo policy online and either pay through ACH or by credit or debit card. Payment options include paying monthly or paying annually. If you do choose to pay annually, you will get five percent off the total amount. Claims are where Figo really sets itself apart. They boast a ‘Pet Cloud’ and very simple claims through their app. You can take a picture from any device, upload it from your desktop and tell Figo what happened all through the app. You can even get paid electronically. Figo pays claims based of the actual veterinary bill, not a benefits schedule like other insurers. You do not to obtain preauthorization, but you can if you would feel more comfortable knowing what is covered and what isn’t. Even if something isn’t covered on your plan, you should still file a claim for any and all vet services so Figo can apply whatever you pay out of pocket to your deductible. Figo doesn’t rush you when it comes to filing a claim, but you must file a claim within 90 days or they will not pay. Figo partners with other companies to bring its pet owners the latest in pet technology. They have a GPS pet collar so you can track your pet wherever they are. This is great for a roaming cat, or a dog that has a dog walker while you are at work. You can always know what your pets are getting into. Figo is good in that it provides you with a sample policy for a dog, cat and their Ultimate plan on their website, and they really encourage you to read the fine print so your satisfaction level goes up. From their policy documents, you can take a look at their cancellation and renewal policies. They do renew your plan annually unless you cancel prior to that, and policies do require an annual commitment, although you can still be cancelled for non-payment or for misrepresenting the health of your animal.